October 27, 2009 Dan O. 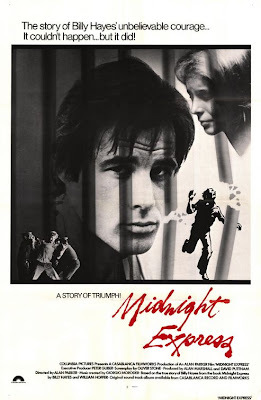 A young American Billy Hayes (Brad Davis) is arrested in Turkey for smuggling hashish and then is sentenced to unreasonable time in a hellish Turkish prison, where he begins to self-destruct, until he musters the courage to plan his escape. This film was based on the book from the real Billy Hayes, and it shows just how crazy you can really get in jail, and how much you really hate those damn security officers. When I saw this film I wasn’t expecting anything great or remarkably, but that is totally a different response than what I was going into. The film is really brutal for all those squeamish people out there. Some will say it was too outlandish or brutal, I say the more violence the better. This got me to really understand how vicious it really was in the Turkish jail. I was kind of on the fence with one factor however. I liked how the film made the Turks the ultimate bad guys that you just want to kill yourselves, but I fell like they were stereotypically horribly portrayed here. They seem so evil, so arrogant, and so very cartoon in the way they act that’s it’s very hard to believe that they are actually real. In the middle of the film there turns out to be a little romance between Hayes and another prisoner, and although I’m not homophobic, I just didn’t feel like it mattered at all. It happens for a scene or two and then it’s gone, and Hayes soon becomes straight once again. This screenplay was written by one of my favorites Oliver Stone and it really does feel like what you see and hear is the harsh reality of prison. The way the violence was depicted and the way these inmates interacted with one another it all felt real, and made me cheer for these prisoners as the story went on. Brad Davis really does a great job here as basically throughout the whole film it all relies on him to carry this film, and he does and gives one of the most powerful performances in a prison film to date. John Hurt is also in this and does very well with the short amount of time he has on screen. The only problem I had with these characters was there wasn’t much of character building on these prisoners. I didn’t feel like I knew them quite well, and I felt like they didn’t know each other well as well. Consensus: Midnight Express gives a very brutal but powerful look at a Turkish prison, but falls a little too overboard when it shows the Turks as just simply evil people.